Can You Recommend Stones For Dealing With A Loss And Feelings Of Abandonment? Can you recommend stones for loss and feelings of abandonment? Thank you very much. Thank you for your question about which crystals can help with the feeling of loss and abandonment. 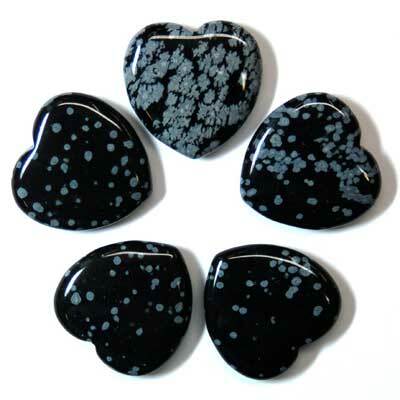 Snowflake Obsidianis a wonderful crystal to work through any grief. It encourages you to release your feelings in a healthy and healing manner and also allows you insight into why things happened as they did…and why it will work out for the best even thought it may not feel that way right now. Rose Quartz is always soothing and comforting since it brings light and love into every situation. It will help you to begin the process of forgiveness which is essential to getting over the abandonment issues. Most importantly it will remind you to love yourself because you are worthy of being loved! Finally it feels as if you need some self empowerment to feel strong enough to move on and I think you would really respond to Amazonite. It is a power crystal that will heal heartache and bring out the warrior in you so that you can get past whatever has happened and live your best life. Thank you again for your question and for your support of Healing Crystals.com. I hope that I have been able to help and that you will not hesitate to let us know if you have any other questions. Disclaimer: I must share the standard disclaimer that I am not a doctor and cannot give out medical advice. Crystals for healing should be used as a compliment to other therapies and not as a replacement for regular medical care. You should always consult your physician regarding your health care.